Advancements in intelligent systems (AI, robotics, etc.) require us to make important decisions now for our future. The technology is currently on the doorstep. We are accustomed to talking to a voice on our cellphone (Siri) and barking orders to a system in our car. Though, it is a commonly accepted notion that AI becomes pervasive in just about everything we do. As we race to adopt advanced technologies, some of the issues include: educating future generations on how and when to use them, providing universal access, establishing social norms – boundaries when it is appropriate, and mitigating excessive security controls. 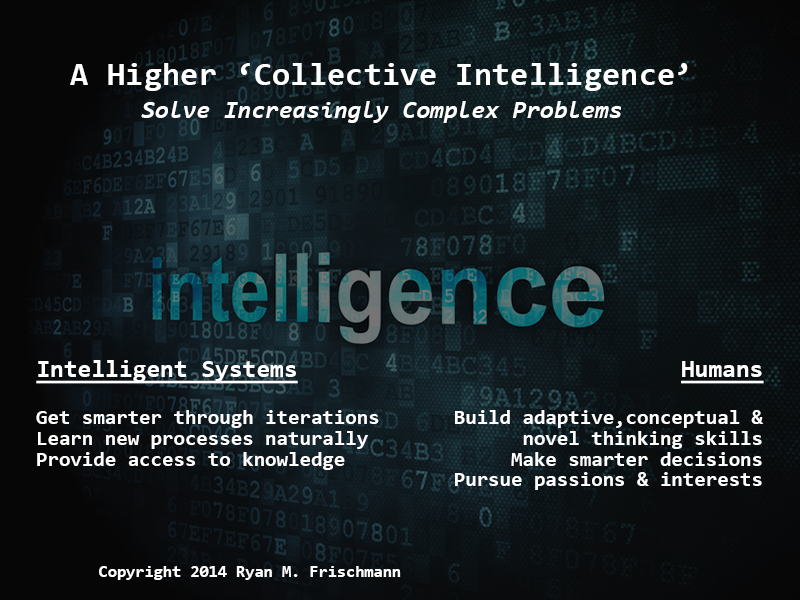 It is still hard to predict the best ways to educate children with using intelligent systems. What is the criteria in deciding what facts and information has to be memorized versus being retrieved from an intelligent system? (As I have said in a previous blog on knowledge, building skills will have more value than memorizing facts and information.) Should there be limitations on the frequency or duration of ‘nudges’? Is it ethical to receive deep emotional encouragement from AI? There was an article in the NYT about an autistic child who found personal satisfaction in communicating with Siri through his IPhone. It is an uplifting story because, as his mom acknowledges, he receives attention and comfort he probably does not get in other ways. [i] As AI becomes more advanced, this situation – having relationships with AI – plays out with a broader segment of the population. According to Erik Brynjolfsson, a professor at MIT: “technology is the main driver of the recent increases in inequalities”. [iv] Futurists predict a bifurcation of the classes, where the middle class splits into the upper and lower classes. Highly skilled professionals with access to new technologies find jobs, the rest will be under- or un- employed. As a society, we must make the latest technologies accessible to all in K-12 and higher education; this might be a simplistic argument, but what about the commitment to follow through on it. Currently there is support in providing internet access to all; in the future, there needs to be similar support in providing advance technologies (like AI) to all. Some people embrace AI, some people abhor AI. Regardless, advancements in AI will continue to move forward because people want to feel happier, increase productivity and become more intelligent. 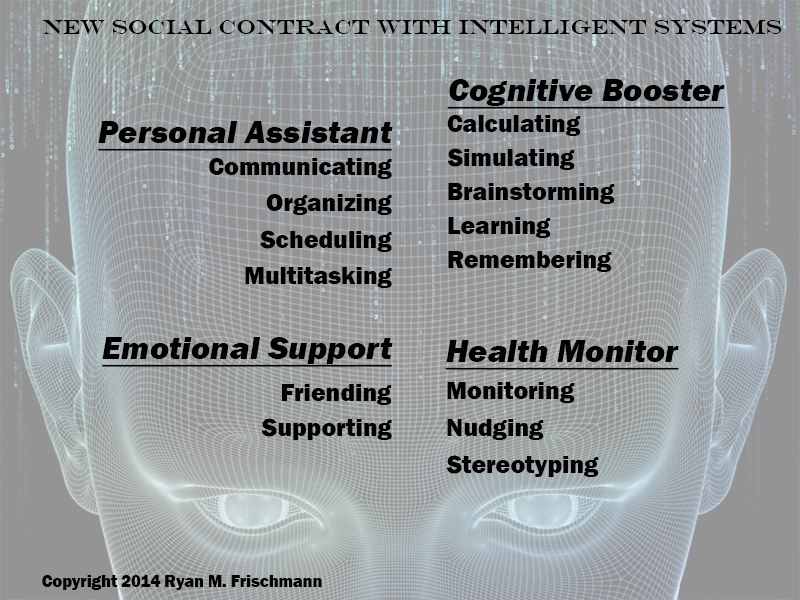 There will be a new social contract laying out how humans interact with AI. In the latest Wired, there was an article about the dangers in giving an authority control over newer technologies – especially those engrained to us in a personal way. Currently authorities can use a ‘kill switch’ on a cell phone, eavesdrop on our communications, and take control of our computer or devices. What about implanted devices? Should you be concerned in interacting with an intelligent system in a personal way, letting it know all your behaviors and what you are thinking? [iv] David Rotman. Technology and Inequality. (MIT Technology Review, November 2014). [vi] Cory Doctorow. Keep Out Don’t Let Uncle Sam Invade Your Devices. (Wired, November 2014 Issue).